Swiss Army 3pk Compact Knife Just $19! Down From $54! FREE Shipping! You are here: Home / Great Deals / Swiss Army 3pk Compact Knife Just $19! Down From $54! FREE Shipping! Victorinox Swiss Army 3-Pack Caddy Compact Knife Tool Just $19! Down From $54! FREE Shipping! Hurry and head over to Proozy to get this Victorinox Swiss Army 3-Pack Caddy Compact Knife Tool for just $19, down from $53.97, after using the code PZY19 upon checkout, PLUS FREE shipping! The Victorinox Swiss Army Caddy Compact Knife Tool is a lightweight multi-tool that packs a punch. It includes a divot, combotool (cap lifter, screwdriver, wire stripper), and small knife blade. Three knives included in blue, black, and red. Lightweight multitool that you can easily carry around. Includes a divot, combo tool, and small knife blade. Has a key ring for you to hang on your purse or bag. 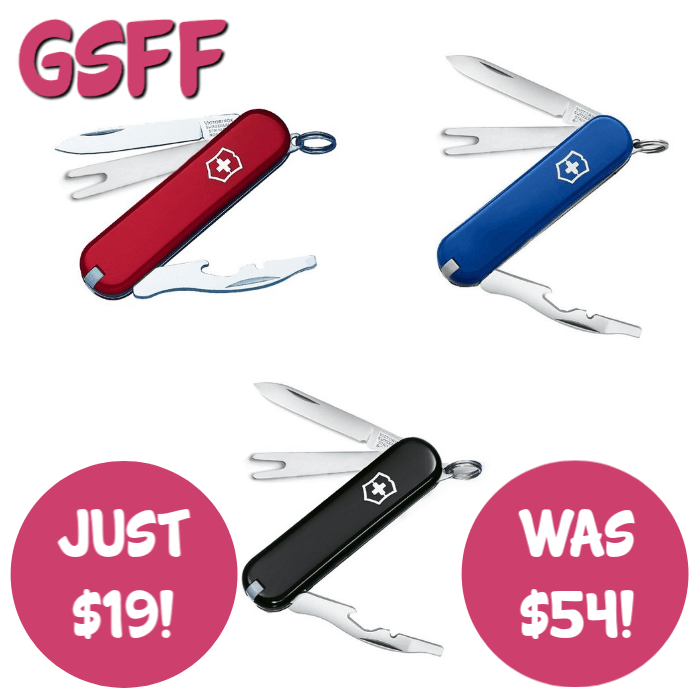 Each set comes with three compact knife tool in blue, black, and red.